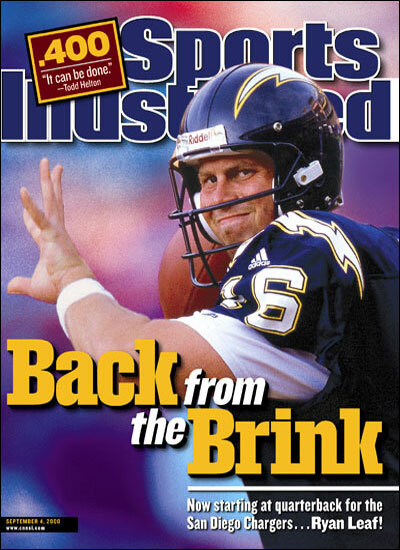 Ryan Leaf, once hoped to be the key to turning around the struggling the San Diego Chargers football franchise, is considered by many today to be the biggest bust in the history of the NFL Draft. On April 14, former NFL quarterback and second overall pick in the 1998 NFL Draft, Ryan Leaf was fined $20,000 and sentenced to 10 years probation for eight felony drug charges by an Amarillo, Texas judge—including seven counts of “obtaining a controlled substance” through fraudulent means and one count of “delivery of a controlled substance”—according to the Associated Press. The drug charges—stemming from allegations that Ryan Leaf presented a number of physicians with an “incomplete medical history” in order to obtain prescription painkillers and, on at least one occasion, attempted to buy a painkiller from a member of the West Texas A&M NCAA football team before resigning as an assistant coach for the team in 2008—are only the latest part of a long and very humbling downfall for Leaf since being selected second overall in the NFL Draft of 1998. In the 1998 NFL Draft, the Indianapolis Colts and San Diego Chargers—teams both in need of a franchise quarterback at the time—held the first and second overall picks respectively, with both Peyton Manning and Ryan Leaf considered the top prospects. Whether Leaf or Manning was to be selected as the top overall draft pick was then the subject of debate for months leading up to the Draft, however, Leaf is now considered by many to be not only the biggest Draft bust in professional football, but in all of professional sports. The story of Ryan Leaf, whose lack of maturity and composure early on in his brief NFL career proved to be his undoing, is one for NFL owners and general managers to remember with caution when scouting new prospects—especially with NFL Draft being just around the corner.